Hello, my name is Valerie. 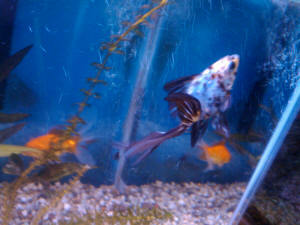 I have 3 fantail goldfish in a 20 gallon tank. One is orange, one is calico, and the largest is white. Something is horribly wrong with my white fish! It started out the same size as the other two about 5 months ago. Now it has more than doubled them. The white one seems to also be the only one acting ill. It has very raised scales and has become very bloated. I noticed today a few scales missing. Also, the very large white fish was hanging out in the back right hand corner of the tank for 3 days and is now settled just floating slightly above the bottom. This poor fish used to be very active. Thank you so much for your time! I immediately purchased a larger tank and added a bubble curtain across the whole backside of the tank approx an inch away from the wall. Im not real experienced with fish but I assumed dumping the water that they were used to into the new tank then filling the rest of the way with fresh water was correct. I moved their existing driftwood and rocks into the new larger tank also. Im not too sure how this is going to work out but my husband added two small crabs into the larger tank with them. Again, thank you so much! with a whisper filter and we only have that goldfish in it. 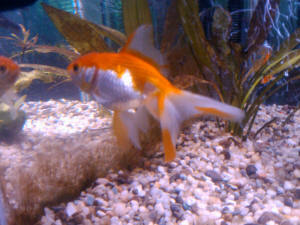 Ashley is a rather large goldfish with a large fan like tail, not really sure what it is but it is about 8" or so. Do you think that this is going kill my goldfish? Could my fish recover from this and what can I do in the meantime till I am able to get a bigger tank? Hello, I just wrote to you about stocking a 55 gallon, thank you very much for your fast and helpful response. Well now I am having trouble with my goldfish. I have an Oranda goldfish (3-4 inches) and a Pearlscale goldfish (much smaller, about 2 inches) in a 20 gallon tank. I tried to do fishless cycling, by adding ammonia and Dr Tim's instant bacteria (from drsfostersmith) but I don't think it worked. I added the Oranda (purchased him from PetSmart), and when all seemed well a couple weeks later I added the Pearlscale (from Petco). All seemed great until I went to feed them one morning and I noticed that the Pearlscale's left eye was completely gone! I watch the fish a lot, and I'm very observant (or at least I like to think I am). I noticed absolutely nothing until the eye was just gone. I spent a good 20 minutes watching them the night before, they looked normal. He just had a hole in his head with a red center, and the eyeball (or possibly the shell of the eye, what was left of it) was stuck to the filter. I have dinosaur ornaments in there (one is a bubbler where the T-rex opens and shuts his mouth), I immediately turned the bubbler down so the T-Rex no longer moved, fearing the ornaments were too sharp and he got hurt. It still has bubbles coming out the back but the mouth stays shut now. I also put a large sponge over the filter intake (it is a Tetra Whisper EX30) afraid that the filter might have sucked his eye out, hoping to diffuse the suction. I argued with myself over if I should take the dinosaurs out or not, but I left them in. I checked their water (too late I fear) and the ammonia was very high. I'm kicking myself for not checking it more often :(. I did a %50 water change, removed the carbon from the filter and started treating the tank with Melafix. checked the ammonia again, again very high. So I did another %50 water change. The Oranda was more active after every water change, and (he is orange with black fins) his fins would go from grey to black the next morning (following each water change). Other than that he (or she) seems completely normal. The Pearlscale (with the missing eye) floated in a slightly pointed downward way immediately before (I noticed it the night before) and immediately after loosing his eye. I thought it was strange but it didn't worry me as he would do that for 3-4 seconds, then swim seemingly happily. I came home for lunch today and he was pointed slightly down... then swimming normally. I got closer and something has happened to his other eye! The first time he lost an eye it looked completely normal and then just seemed to fall right out, cleanly and completely, leaving an empty socked with the red cord in the center (which then got to be darker with time). Now his eye is purple, and dented in the center :(. I have been watching him like a hawk, looking for any sign of anything and I have seen nothing. I heard that eye loss can be caused by something that causes little holes in the head and down the fish, but I see no holes. I thought about PopEye, but his eyes looked completely normal until each incident. I feel just terrible for letting the ammonia build up like that, and for giving him pointy ornaments. Are they too dangerous for him? The two fish seem to get along well, I've never seen them quarrel, and they even share food. I feed them goldfish flakes and algae wafers (I am planning on switching their diet to real, fresh food/veggies) but I didn't want to change too much when he was sick. He is swimming, but stops and floats in-between swimming. He is swimming normally, when he floats he points down slightly, but doesn't tip, sink, or rise. I'm pretty sure the other eye is too far gone to save. I have attached the best picture I could get (the black on him is his color, not a sore, and his reflection looks weird but he doesn't have white on him like that, must be the gravel reflecting), plus a picture before he was injured that shows the T-rex. Is it cruel to have him live like this? Will he be ok? Is the Oranda in danger? I don't have a quarantine tank for them (I do have a 2.5 gallon tank that I used to quarantine small things for my tropical tank like fry and ghost shrimp, it has a small in-tank filter, but it just seemed cruel to move him to such a small environment).Help! What do I do? Hello, I have never had any luck keeping goldfish alive, but find myself in charge of doing such. My family has a 3 gallon tank with filter and 1 small plant along with small rocks at the bottom of the tank. The occupants of the tank include: 1 small snail, 1 fantail (2 inches, not including tail) and 1 feeder goldfish (2 inches, not including tail). The feeder goldfish has been in our home for 2 months and was rather lazy until we acquired the fantail last week. The fantail has a belly that seems to be growing, while the feeder goldfish has not got a belly. I have noticed that the fantail likes to hide out near the top of the tank corner, between the filter and the air tube. I thought it was getting stuck back there, but when I move the tube, the fish frantically swims away and then swims right back into the same position. Today, both fish have been 'hiding' back there'¦ and only wanting to come out to eat (flakes which I put in the tank about 3 times a day). Any suggestions as to what could be the problem with the goldfish? Thank you in advance for the time and energy in which is required to read and respond. Much thanks, After separating the goldfish, they both seem to be doing much better! Great website with lots of helpful information! I have 2 Oranda goldfish, one is sick and one is not. the water is changed fully once a week. In the tank there is a duckweed plant and nothing else apart from gravel. They are both fed about 2 sinking goldfish pellets daily. Nothing else is added to the water. We have had both goldfish alive and well for over a year now and have had no problems so far! About a month ago, the larger fish developed an illness - his veins were bright red, his fins droopy and his breathing looked short. He wouldn't eat and he just stayed in one place all day! We went to the shop where we bought him and they gave us some medicine (a liquid which was brownish red in colour) but I never found out what specifically was wrong with him or what the medicine was (sadly I live in the Netherlands and cant speak the language)! After 3 days he was fine! But a few days ago we noticed he was sick again (exactly the same as before) so we put him in another tank and got the same medicine from the fish shop to treat him and the red veins disappeared. But now he just lies on his side and seems to be stuck at the surface of the tank. I tried feeding him some peas but he's not eating anything at all and hasn't for days! So from research online it seems he has a problem with his swim bladder - but if he's not eating anything.. how can he eat the peas which cure it? I am worried he will die of starvation before we can fix his swim bladder problem! We have another goldfish who lives in the tank with him and he is 100% healthy - he is much smaller though! Thank you in advance for you help! I hope I have given enough detail for you! That is what I thought but the man in the shop said that it was fine! Do you have any other advice? Upon closer inspection my tank is more like 13L (we guessed before) - would you say this is still too small? If it is then we will buy a new one as soon as possible - but if my goldfish dies before we manage to get one there is not much point! 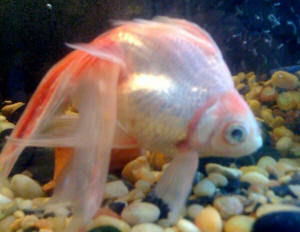 Do you have any advice about the health problems my Oranda goldfish is having - is it stress from the small tank size? he is now in another tank on his own which is around the same size as the one he was in before. I have given him some peas but as mentioned previously he is not eating. His red veins are now back but his problem with swimming looks a bit better. We were originally advised that this size of tank would be fine, and that we didn't need a filter when we originally bought it, as long as we changed the water regularly. In hindsight this arrangement may only be for people who like the look of fish but don't care if they die or not.. I love my fish and don't want them to die! Everything on the internet is conflicting and I am not sure what to do! I have a 16 gallon bow front tank that has been running great. There are two fantail goldfish in it - and the older one has been in there for over a year. The younger one has been in the for several months. A few days ago my kids wanted to add a snail to the tank. We got it from a reputable store and added it. We also added a few fake plants that day as well. The next morning the older fish was just laying on the bottom and the tail fin had bright red streaks. I did a water change with not much improvement. He continues to lay on the bottom and today is not coming up for food. His tail is more streaked and starting to fray. I added one dose of Melafix last night after doing another water change. The other fish is just fine and is staying at the side of his companion (when I add food the healthy fish tries to nudge the sick fish to the top to get food). The snail is active as well. My little girls love these fish is there anything further I can do? <Adding the snail as likely the "straw that broke the camel's back" here. The goldfish is quite listless now, what is your recommendation for best antibiotic treatment. Will it be a problem to add since I added the Melafix? Should I remove the snail until I can get a larger tank? My name is Vera and I'm reporting from London. I have been enjoying your site for months now,. studying and learning so much on the way. I've always loved biology..
One likes to be prepared when a fish gets sick,. but now that its happened it appears I still need some help. I have 3 fantails in a 60 liter BiOrb tank. I do realise now that that was silly as it might be too small a tank even though they are small. 2 of them are just over a year old and I got them when they were babies. I've just added a new baby. 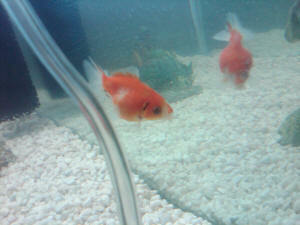 His name is Tinie Tempah) and they have all been getting on fine until a week ago. I've been checking the water quality and doing 20 percent water changes because of the new fish. I discovered that T.R and T.S had clamped fins and a cloudiness to them..
T.R was resting a lot inside the plants. He's always done that on and off as he is sensitive to a lot of foods and gets swimbladder problems. For that reason I feed them peas/broccoli/carrot and the occasional treat of brine shrimp and once a week a sinking pellet. Anyways, back to the sluggish behaviour and cloudiness of fins,. Red veins appeared around the mouth of T.S. He was also behaving aggressively to his longtime friend T.R and vise versa. T.R doesn't use his tail, it just hangs down like a useless tool. Tinie Tempah is oblivious to all this and swimming around happily munching on plants. The aquarium specialist in town advised to use 3 table spoons of Aqualibrium salt and to treat with a product called eSHa 2000. Its a 3 day/dose fungus,finrot and bacteria treatment. I've taken the filter cartridge out but the pump is still on. I was advised to treat all fish. It's 5 days later and T.S has perked up a lot! His red veins are gone and his fins look a little clearer. Tinie Tempah is still playing and having fun..I'm super happy he didn't get sick. I've been doing 20 percent water changes because of the friendly bacteria that might have been killed off by the medicine. When he did decide to swim he would have no coordination and just crash,. poor thing. I decided to quarantine him in my old bowl. (25 liter) It has an air pump. I took some original aquarium water and some new tapwater with tab safe and added some cycle. Most of the salt should be gone. I've also added a plant so he can hide/rest if he likes. I'm sure he hates the bowl,.i know now how awful they are thanks to helpful articles on WWM. It will have to do as a temporarily arrangement. The weird thing is that at first he would float! Later he's at the bottom again and he seems to be resting. He seems a little better today.. not swimming much though and tired and uncoordinated and no appetite. So my questions are.. His bowl is not cycled..shall I add a carbon filter to the airpump or add a new medication. He's become very skinny and my guess is an internal infection. I hoped the original medicine eSHa 2000 would take care of it but maybe it wasn't strong enough? Its day 5 now since treatment started..what could I do next? Thank you so much in advance and I do hope to hear from you soon! Unfortunately, Tiny Rider has travelled to heaven. It literally happened 20 minutes before I received your mail. nitrite 0. I could do a water change to bring down the nitrate but I've just given them a halve dose of the medicine eSHa 2000 as a follow up. TS fins are not cloudy so much and he seems happy but his tail fins are fraying a bit. 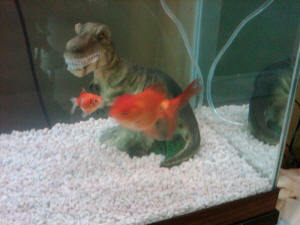 Tinie tempah is following him around and picking at his fins. I think fin rot is visibly present now. Originally the fins were just cloudy and there was a white tip at the end of his tail. For this reason I've given them an extra halve dose as is suggested in the paperwork with the medicine. TT is still looking fabulous and young. I hope it stays that way! Shall I do 30%a water change tmrw to get the nitrate down? We are day 5 now and I wonder when I should stop medicating. Day 1-3 was full dose -halve dose-halve dose. Day 4 was a break. Now that the fins are fraying on TS I've done another halve dose today. Thank you so much for your reply and I'm going to start looking for a nice 40 gallon tank I think. One of my goldfish has pop-eye and a white fungus-like growth on his mouth. Also, the area around his mouth has reddened. It is a seven year old fish in a mature 55gal tank with two other seven year old goldfish. The other two goldfish seem fine. although I do not change the charcoal filters very often. I changed the water 3 days ago, and had not noticed this problem before the change, although it is possible that the problem was existent at that time. I have isolated the affected fish in a hospital tank. I would like to begin treatment of this fish. The research I have done indicates that this is most likely a bacterial (rather than a fungal) issue and that antibiotic food is the best treatment. The fish is eating, so using food antibiotic is an option. Please look at the attached picture and let me know if you agree with the diagnosis and treatment. Do you recommend food antibiotic or water treatment? Do you have a preferred brand of food antibiotic for goldfish? Should I also treat the water with an antifungal in addition to the antibiotic? Do you have any other suggestions? Should I (after a thorough tank cleaning and water change) return the affected fish back to the large tank with the others? What should I expect in terms of the timeline of improvement of the pop-eye and fungal growth? If I see no improvement after a reasonable time should I consider any medicinal options? Thank you for your speedy reply, WetWebMedia is a great resource! Hi. I can't seem to find an answer anywhere to this and was hoping you could help. I have an Oranda goldfish who is about 5 inches long now. He lives in a 10 Gallon tank with a Marineland filter and bubble stone. There are two decorations in the bottom of the tank. He recently changed almost all black, when I got him about 3 months ago he was gold with black tips on his fins. He is eating fine. About a week ago I noticed what looked like true fungus on his side. It just covered one scale. For 5 days I was treating him with Sentry Maracyn, and after talking with my co-workers (I work at PetSmart) I got him API Fungus Cure power that I started him on today when I moved him to a new identical tank as the one mentioned above. don't seem to be bleeding. What is worrying me is that the scale is just hanging there with the redness where the scale used to be, I love this big fish, I enjoy watching him swim around. 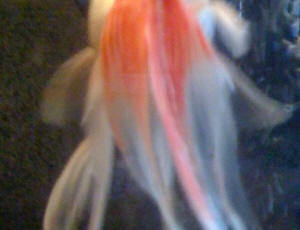 Yesterday afternoon a blood red spot appeared on our 4 year old goldfish's (fishy) dorsal fin. By the time last night came around white lumps were appearing on the red spot. Now this morning it appears the white lumps are spreading onto his back. I've searched for answers, but don't want to start treating him willy nilly. I've attempted to take pictures of the spot, they are quite blurry. and he is the only fish, but quite large now. The carbon filter is for a 20-30 gallon tank the smaller filter was not keeping it clean and he was not as active. I did a 40% water change last Thursday and treated it with Nitroban. I'm not very knowledgeable about ph I'm sorry. I did look at the ph kits in the store, but was really overwhelmed about which one to get. I apologize in advance for my ignorance. Thank you for your response. We purchased a 20 gallon tank for him today. Hello hope everyone is well. I stumbled upon your site via Google while I was attempting a rescue mission. I've been reading and cautiously following relevant advice give through your FAQ pages and I'm ha[[y to say that everything thus far have gone relatively smooth. However, today I'm not so sure...something suspicious is amiss...so here I am asking for individual advice. Stats- 3 fancy GF (about 3-5 inches not including tail) in a 20 gal. tank with gravel and plants only. They've been in the same tank for close to 7 months now. They've grown like weeds and have not shown any signs of health issues. I do know that the tank is a bit small and they are growing rapidly and with spring approaching which means the males (if I have any) will be getting a bit frisky so they need their space. So I recently purchased and set up a 55 gal. tank and it is cycling as we speak. ( It's been 6 weeks with a handful of water changes and a pitch of food every few days, but ammonia is still around .75ppm and the tank doesn't show any signs of bacteria growing). Realizing that I am not completely "out of the woods" just because they haven't been showing any signs of distress and look very healthy because of their growing size and volume in which they live I've been anxiously awaiting the end of the big tank's cycle. About four days ago while I was doing a routine examination of the fish I notice that on of them have small spots on her tail fins. I immediately thought Ich and did a water change. I waited until today, my day off, to do another water change. (I usually do a 35-50% water change every 5 days to combat the ammonia) I added roughly 5 tb.s of salt and am planning to stick the heater in there and start raising the temperature. I dissolved the salt before adding it with some treated water. About 10 minutes after I closed the lid another one of my fish started having these, for like of better terms, seizures. He'd swim then hit the glass and convulse violently then swim a bit then do it again. From what I've read this could mean a variety of things, but without visual evidence I don't know what to do. I took about 1 1/2 gal. of water out and added the same amount back in to dilute the salt if that's what's causing it but I'm leery about doing anything else. Their eyes are clear, their fins are raised, gills are not red, breathing is not rapid, scales are shiny, and their appetites are healthy with the exception that the don't seem to be as excited to see me as usual. They would swim to the front of the aquarium, they're not acting as ravenous as usual. Am I missing something in the cycling process of the 55 gal.? Why is it not cycle and ammonia so high? the spots described for Ich), but they are quite small- could it be fungus? method for Ich first and then more wide spectrum medication if it fails? Without any outward visual symptoms is there any other way to diagnose the seizures/convulsions/shaking? Should I wait to add the heater? That's all so far, I'd like to thank you ahead for your advice. The site is great and everyone here is awesome. Thank you for your response. I'm glad to hear it might not be as severe as I had thought. I will admit that lately I've been a little heavy handed with the food. I'll definitely cut back to once every other day. When I first set up the 55gal. I added about 10 gal. of the water from the older aquarium with about two cups of gravel and some filter media that's also from the older aquarium. I let it run that way for a couple of weeks taking out and pouring in old water from the water changes from the 20 gal. after awhile there's a smell of mildew and a white slimy film on the hoods, filter and glass around the filter. I wiped it tested the water (Ammonia .80ppm) did 50% water change with treated water and never added old aquarium water to it again. Now what I would do is whenever I get ready to throw out an old sponge I'd just toss it into the new tank. I don't smell the mildew anymore, but I still see the white/opaque slime. What do you think that could be? Oh, and to answer your question...they're fancy, but not the delicate ones. a Ryukin, a Fantail, and an Oranda (the Oranda has a small Wen (sp?) and it's actually the most lively in there). I think you were onto something be cause the white dots on my goldfish have almost completely diminished over night. Also, while reading the link you sent me I realized that since it's been chilly here the temperatures in the have fluctuated within in the six ties-seventies range. I suppose suppose that's good for the fish, but is a clue to why the 55 gal. is taking so long to cycle. So, I think that I'm going to hook the heater up and keep it at a steady 77Â° F. Your thoughts? One last question- the tank that the fish are in have always have adequate oxygen flow grom the two HOB filters, the water fall effect stirs up the water very well and I've always seen small air bubbles throughout the tank. From time to time would see the bubbles on the fish. They will have them on their scales, fins, their mouths ect...could this be harmful? Welp! Thank you so much again for your advice! Thank you for the speedy response. I'm going keep reading. By the way, it's Ms. Truc :), but please call me Truc. No questions this time. I just took a couple of pictures and wanted to send them in for you to check out. They're not amazing by any means, but I'm a proud parent. They're mostly of the Oranda because the others weren't going to stay still even if I threatened them with a frying pan :). Our 2-year old Fantail goldfish, Goldie, has had a number of problems lately, and we're hoping for some expert help in getting her rehabilitated. It all started when we introduced a new Calico goldfish into the tank. The Calico started nipping at Goldie's tail, and we subsequently returned it to the pet store so as not to cause Goldie anymore harm, but ever since then, she hasn't been herself, and has developed a whole host of ailments. thinking it was a skin problem, and at first she seemed to have more energy and looked to be doing better, but then on the 2nd or 3rd day of the treatment, a white fuzzy patch (fungus we're guessing?) started to develop over the area that was previously red. We also noticed that the tip of her tail started to split and then the tip of it went missing. Additionally, we noticed tiny holes in her bottom fins (although I didn't see them until I looked really closely, so they may have been there already). Since her fungus seemed to be getting better, and our pet store only told us to do the salt dip for 3 days, we did not do a salt dip last night. While her fungus is still shrinking, the area around the edges that it used to be are now black, and she was extremely lethargic today; she barely moved from the bottom of the tank! Could it be due to the high ratio of Stress Coat? We did another 25% water change today to try and dilute the Stress Coat concentration, and she's less lethargic for the time being, but I'm still unclear on how much longer (if at all) to continue the salt dips and water changes. Should we keep them going until all signs of fungus/red scales/black fins/torn/holy fins disappear, or should we stop sometime sooner? Should we be doing something else altogether? Any insight you have would really help. Thanks, Neale! So just to clarify, should I be stopping the salt dips altogether and going with the anti-fungal/anti-fin rot treatment *instead*? Or is this *in addition* to the salt dips? Oh, and if the latter, should we be using aquarium salt in the main aquarium as well (we usually use a small amount of salt in her main aquarium just as an overall stress reducer/tonic)? And thanks for the advice about getting her a friend. That was our hope with the Calico, but it didn't turn out too well. If/when she's all healed up (fingers crossed! ), we're hoping to try again. And you think at least a 30-gallon tank for 2 goldfish? Our pet store had said a 10-gallon would be fine for 2. Thanks, again! Cheers to you, too! but the poor thing took quite a beating. She's missing several scales on the area where she was stuck to the tube, and she must be seriously injured because now her little body is stuck in a U-shape and she can't even swim straight. Is there any hope for her? Anything we can do to help her heal? I have a comet goldfish that I bought 5 months ago from Wal-Mart (I know probably not the BEST place to get a fish). Anyway, "Larry" has been doing great, in fact he is the lone survivor of our original fish purchase. He is about 4 or 5 inches long, and in a 10 gallon aquarium. I do a partial water change every 2 weeks, and I try to a full water change at least once a month. (a fantail-about 1 1/2 in. long, and an algae eater-about 2 in. long) I noticed that some of Larry's scales were sticking out on one side and the skin underneath looked kind of yellowish. Today I noticed that his other side is bulging a little as well. I have read about dropsy and constipation, but I am not sure which of these he could be suffering from. (the box said it was safe for the other fish in the aquarium too), and I added some "Quick Cure-Fast relief from Ick and protozoan parasites"
to the water as well (in case a parasite was causing the swelling). Should I isolate Larry from his tank mates, and is there anything I can do to help him? Any advice would be greatly appreciated. Thanks! I will get Larry his own tank. I asked the guy at the Wal-Mart if it was healthy for me to put the 2 new fish in with Larry (told him the size of the tank) and he said yes. Now I know not to listen to those guys anymore! Thanks again. Hello WWM Crew, I thank you in advance for your wonderful web site. I have a question re: my Oranda buddy Sherbert. I have him and his companion (Lady Ga Ga) in a 20 gal (long) tank. Waiting on a 55gal to cycle to move them to their new home. Tank is fine no problems. The issue is that I noticed last night Sherberts top (lip) is cut into, the only culprit I can deduce was a Whelk shell I had in th tank and PROMPTLY removed after th fact. I feel so badly, I felt th shell to make sure it wasn't sharp, but I'm sure this is what caused this. I have no other substrata in the tank, except a clump of live water grass (can't recall th name) they enjoy playing in. Please advise as to any medication or treatment I should follow through with. I hate I put my little buddy in harms way with that stupid shell. I feel real bad and want to see him live. Just a quick up date on Sherbert. He died today, I feel horrible. I wish there was more I could have done. I noticed last night he was not eating and lifeless. His mouth however, looked as though it was healing some what. Any ideas for future reference? Thank you so much for your time. I'm rather new to the realm of fish husbandry. It was a pretty serious wound, but looked as though it had begun to heal within a couple of days. He just kind of isolated himself away from the other fish and deteriorated. Thank you again for your reply. I will be keeping up with the latest via the web site. ( I know its small but there haven't been any problems in 2 years until now). The other fish are completely fine. There is a male in the tank who recently matured and is bigger than the others and pushes the Ranchu around a bit since she is the oldest female ( I don't know if that is relevant or not). She developed a red spot on one of her sides and a couple days later there was some red on her other side as well. I did frequent water changes and the red spots have mostly gone away over the past week but now it looks sort of furry. She doesn't have any other furriness except for where the red spots previously were. There is a very small hole in one of her side fins and I'm not sure where it came from but it doesn't seem to bother her. She is still active and her breathing seems fine but its been over a week since she last ate. What can I do to help? Hello! Thank you in advance for taking time to help me with this. with a lot of aeration, filtration and plenty of his fave foods, oranges, spinach and peas among them. Just recently we thought for sure Biggie Smalls was leaving us because he got a NASTY infection of what I think might be hemorrhagic septicemia (pix below). septicemia and can it affect their sight or cause blindness? Should the cloudiness in his eyes be going away if he recovers completely? And...if (and I hope it's not true) his sight is impaired, is there anything to consider when feeding a fish that can't see? Or will their other senses help them know where the food is? Is floating food better than sinking in that case? Sorry, kind of went nuts with questions at the end! Thank you again for your help. <Something, in addition to this fish being in too small a volume of water (needs about twice this 15) has conspired to lower its immunity/resistance.